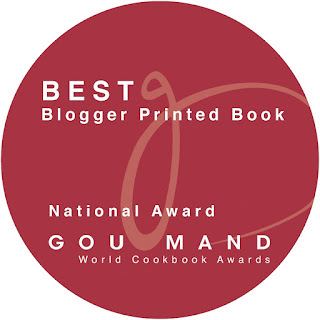 Editor's notes: I have re-written this recipe to better explain the method used. 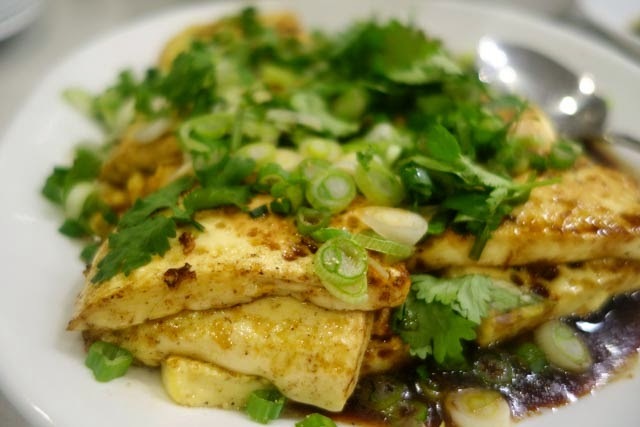 Egg tofu is delicious, cheap, nutritious and easy to make. Though not as quick as the 1-minute tofu assembling recipe, the additional work of making your own tofu can be fun and satisfying. Akin to making custards, you see various liquid ingredients turn into a luscious custard which you can easily cut and scoop with your spoon. When egg is heated up, it turns solid. 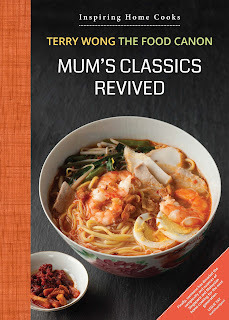 That is probably the first dish you help your Mum to make. This is the magic of proteins as they coagulate, and the albumin in the egg white will. Of course, egg alone will not result in a soft custardy texture. You need to add water and the properties of both the water-clinging and water-repelling amino acids will react to form a soft tofu texture. Heat has to be applied gently for this to happen. This explains how we get steamed egg, probably one of the first dishes you ate as a child. The steaming method is used as air is a poor conductor of heat. It is simply a gentler way of cooking. Steamed egg is water added to egg. If you replace water with soya bean milk, you get egg tofu. Nothing else need to be added, except for salt for the flavour. You end up with a piece of tofu which is firm enough for you to pick up by hand, if cut into smaller pieces. Apart from gentle steaming, another point to note is the thickness of your custard. If your custard is too thick, before the center is heated through, the sides will be overheated. It will result in curdling (part solid, part- liquid). It happened to me once and it looked like someone had vomited onto the tray! Just 1 cm in thickness is best as it needs only 7 minutes to steam. You could bump it up to 3-cm but I advise you not to go beyond that unless you have a bain marie or Sous Vide, where you have better control of the temperature and able to keep it constant. I learnt this egg tofu version from a written recipe by a local chef. It is a simple 3-ingredient dish, and the complexity only increases if you want to make special sauces like superior stock. If you use pre-made sauces like soy sauce, bango sauce (kecap manis), it is a very straightforward dish. Use a shallow pan and prepare your steamer. Line your container with baking paper for easier handling later. Mix the eggs to break up the yolk. Add soy bean milk and salt together. Mix well and strain. When the steamer is ready, pour the mixture on to the container. The liquid should be about 1 cm in thickness. Steam it for about 7 minutes over very gentle fire. Use a chopstick to test whether the tofu is firm enough. If you gently drop the chopstick on it and it bounces, it is ready. From here, just like you will use commercial tofu, it is up to you how you want to eat it. I recommend pan-searing as you will get an omelette-like surface, creating a two-texture tofu. Of course, it is also nice eating as is. Remove from steamer and let it cool down. When cool, put the container in the fridge for an hour to let it harden a bit. Take tofu the from fridge. Turn over the container and cut into a square (1 x 1" or 1 x 2"). Heat pan. Add some oil and pan-sear the tofu squares. Be careful when handling the delicate tofu and ensure both sides are seared. From here, you can use different types of sauces and garnishing. You can do a Japanese dashi stock sauce, garnish with bonito flakes, Chinese soy/sesame oil sauce or Indonesian bango plus soy sauce, garnish with chopped spring onions and fried shallots. You can also add meat floss. You can buy unsweetened soy milk from the super mart (Sobe brand) or just pop over to the nearest hawker stall selling soy bean drink. Of course the better quality of soy milk you use, the better your tofu will be. Give this a try. Like me, you will end up wanting to make it again as it is easy and cheap to make and you end up with a fantastic dish. Once you get confident with getting the texture right, you can experiment with other kinds of tofu recipes. I use shallow trays. I just sit the tray and balance it in the wok, without any holders. This is a version I made for Chinese New Year, with abalone and mushrooms added. Here is another delectable version. Just add soy sauce and garnishes. This makes me hungry. I love Tofu but I have never tried it. I should try this with my kids soon. Maybe tomorrow night. I have heard this has so much proteins and it is so good for our health. It is obviously a healthy food. You have done a great job by posting this receipt. This makes me hungry. I love tofu, but I've never tried it. I should try that with the arrival of my children. Maybe tomorrow night. I've heard so much protein, it is so good for our health. This apparently is a healthy food. Posted this receipt, you have done a lot of work. This looks amazing! Thank you for the recipe and clear instructions - I'll be making it at home this week. Love the site, keep up the great work. This brings back good childhood memories, and so simple. Thank you for another great recipe! Tried the recipe but was totally different from the photos here. Mine turned out pale yellow almost white and like silken tofu. Sent a email to you with photos for your comment. Thank you.